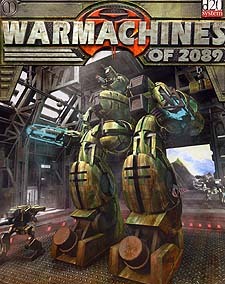 Warmachines of 2089 is the first supplement for Armageddon 2089 - Total War. Featuring over 40 new WarMeks for use by Players and Games Masters alike. Also included is the full, detailed history of the Warmek showing how a tool for peace became the most feared sight on the battlefield. With further guidelines for creating your own WarMeks. WarMachines of 2089 also highlights, for the first time, the new and experimental four-legged WarMeks. Armageddon 2089 - Total War takes conflict to a new level of hard sciences and real world physics, featuring the most detailed combat rules yet devised for the d20 system. Enter a world packed with enough action and political intrigue to guarantee players are kept on the edge of their seats. From multi-ton WarMeks and armoured fighting vehicles to the very latest in fighter design and special force operation, live the true horrors of war in the modern age.